One of the Magic Elixirs of William Lines and Carlos A. Gothong & Co. The term “magic elixir” refers to a potion that gives one powers and in modern usage it refers to a sort of magic that was the reason for an entity to rise. In this article I am not referring to something illegal but to one of the reasons for the rise of two of the most storied shipping companies of the Philippines where in their peak were contending for the bragging rights of being the biggest shipping company in the country. Historically, the Chinese mestizo shipping companies were not as blessed as the Spanish mestizo shipping companies which antedated them in the business. The latter not only had a head start but they also possessed powerful political connections and that was very important then in getting loans from the Philippine National Bank (PNB) which dominated commercial banking then as there was almost no other commercial bank big enough in that time able to finance acquisition of ships. It was also crucial in getting ships from the National Development Corporation and earlier in getting surplus ex-”FS” ships from the Rehabilitation Finance Commission that was awarded as war compensation by the US Government. Of the two companies, William Lines had an earlier start and it was also blessed by political connections – the founder of the company, William Chiongbian happened to be a powerful Congressman who in his run for the Senator missed by one just slot (and his brother was a Congressman too at the same time but in another province). Carlos A. Gothong & Co. had to start from the bottom as it began almost a decade later than William Lines in liner shipping. But later it was blessed by a good strategic relationship with Lu Do & Lu Ym, the biggest copra concern then when copra was skyrocketing to being the Number 1 cash commodity and export commodity of the country. In the national liner scene, after its restart right after the end of the Pacific War, the strongest after a generation were the shipping companies that had routes to Southern Mindanao. Left behind were the shipping companies that just concentrated in the Visayas routes like Southern Lines, General Shipping, Philippine President Lines/Philippine Pioneer Lines/Galaxy Lines and other smaller shipping companies to Eastern Visayas, Bicol and the near routes to Mindoro, northern Panay and Palawan. Actually, in my totem pole of national liner companies in 1972, the Top 5 — Compania Maritima, Gothong & Co., Aboitiz Shipping+PSNC, William Lines and Sweet Lines — all have routes to Southern Mindanao. What made Southern Mindanao the “magic elixir” of William Lines and Gothong & Co. when the latter was not even a liner company in the latter half of the 1940’s and William Lines was behind many shipping companies that preceded them? In business, there is nothing better barring the illegal than a customer base that simply keeps growing and growing. And that was what Mindanao then was to the shipping companies Southern Mindanao. Before the war the population of Southern Mindanao was small and was practically composed by natives. That was before the government encouraged and assisted the resettlement of people from other parts of the Philippines to resolve what was called then as the “population pressure” (rapidly growing population in an agricultural economy with not enough land anymore to be divided into the next generation and there were no contraceptives yet then and the average number of children was five). Northern Mindanao after the war already had Visayan migrants as it was just near the Visayas and the Spaniards was able to establish a strong foothold there even in the 19th century. But Southern Mindanao almost had no transplanted population and it is this part of the Philippines that experienced the greatest population boom after the war with what was called by the Moro National Liberation Front as the “colonization” of Mindanao (well, even some politician used the word “colonization” before that became politically incorrect). Where before in the 1948 Census the transplanted population was just a minority in Mindanao, in the 1960 Census the natives suddenly realized they were already the new minority and in the 1970 Census they saw they were beginning to get marginalized (Sultans and Datus who were once Mayors were even beginning to lose the elections). This population boom, the opening of land for cultivation and the consequent exploitation of the natural resources of Mindanao needed transport and it was not by air (and not by road definitely) but by ship. And by this all shipping companies that were plying the Southern Mindanao routes benefited a lot. Of course shipping companies serving Northern Mindanao also benefited but not to the same extent as the Southern Mindanao shipping companies. And anyway the shipping companies serving Southern Mindanao were the same shipping companies serving Northern Mindanao (with exception of Escano Lines which has also routes to Northern Mindanao but not Southern Mindanao) and so the benefit of those serving Southern Mindanao were double. If we analyze the biggest shipping company then which was Compania Maritima, most of its ships were assigned to Southern Mindanao. That was also true for the liners of Gothong & Co. (this company has a lot of cargo-passenger ships then to gather the copra for Lu Do and Lu Ym) and William Lines (which assigned 3/4 of its ships in Southern Mindanao early and Gothong & Co. of to 80% in 1967). Although William Lines started ahead of Gothong & Co., the latter vaulted ahead of the former in the 1960’s. I think the reason is William Lines relied too much and too long on the ex-”FS” ships and it was only in 1966 when they acquired other types. Meanwhile, Gothong & Co. acquired ships from Europe earlier and in greater numbers. That does not even include the Type “C1A” ships acquired by Gothong & Co. which were big ships and were really ocean-going plus a lot of small ships the likes of lengthened ex-”F” ships and a host of local-builds. In ports of call, Gothong & Co. simply had too many because of the need to gather the copra of Lu Do & Lu Ym which was exporting a lot (and which Gothong & Co. also carried). For sure, Compania Maritima which was already the Number 1 right after the war also benefited from the growth of Mindanao. However, their subsequent collapse in 1984 at the height of the financial and economic crisis then besetting the country is of another matter. 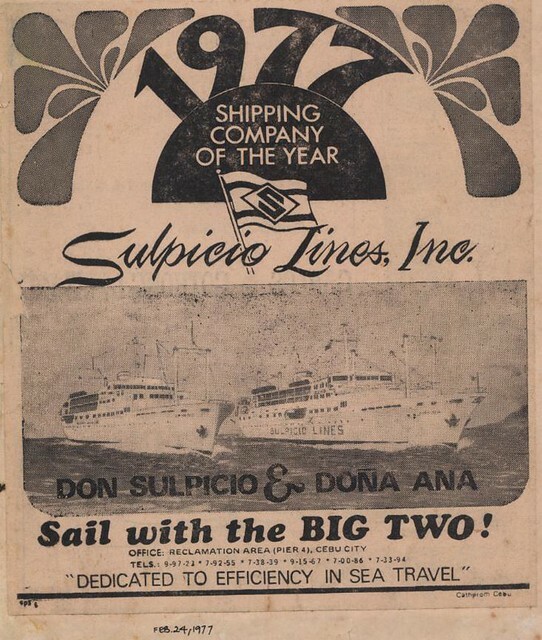 Sulpicio Lines, the biggest successor company of Gothong & Co. also benefited from Mindanao after their creation in 1972 so much so that later it became the biggest shipping company of the country in the 1980’s. What happened then to the shipping companies started after the war that just concentrated on Visayan routes? Well, by the 1960’s Southern Lines and General Shipping were already gone from the local scene and a few year later Galaxy Lines, successor to Philippine President Lines, the local operation and Philippine Pioneer Lines was also gone. And the smaller shipping companies like Escano Lines, Bisaya Land Transport (this was also a shipping company) were just in the fringe and barely alive in the 1970’s like the shipping companies that just concentrated in Bicol, Samar and northern Panay. That was also the fate of the shipping companies that was concentrating in what is called MIMAROPA today. After the 1970’s practically only batels survived in the last area mentioned. Meanwhile, Gothong & Co. threatened Compania Maritima for Number 1 before their break-up in 1972. Later with the downward spiral of Compania Maritima, Sulpicio Lines and William Lines battled for Number 1. And when Compania Maritima quit and Aboitiz Shipping Corporation also quit Mindanao, Sulpicio Lines (the biggest successor company of Gothong & Co.) and William Lines further benefited. Actually, no shipping company that did not serve Southern Mindanao ever became one the top shipping companies in the country (that was before a lot of liner companies were culled in the crisis of the 1980’s). That was the importance of Southern Mindanao for the shipping companies of the country. William Lines and successor of Gothong & Co. Sulpicio Lines ended up the Top 2 in Philippine shipping. Know what? They were the only survivors of the Southern Mindanao routes after all the rest quit (of course, Aboitiz Shipping came back later and there were others in container shipping). Now, there are no more liners to Southern Mindanao, funny. But, of course, that is another story. The magic elixir dried up? Of all the many ports of Northern Mindanao, the geographical area and not the political-administrative region, it is Surigao that I did not see losing its liner connection to Manila given its history and not its demographic and economic profile. In the old days, Surigao had six passenger-cargo ships from Manila calling and dropping anchor every week whereas the likes of more known and bigger Iligan and Zamboanga did not have that frequency. So for me the loss of Manila connection by Surigao is almost unbelievable when the likes of Nasipit, Cagayan de Oro, Iligan and Ozamis still have their liner connection to Manila. After the war, in the 1950’s and 1960’s, the likes of Escano Lines, Philippine Steam Navigation Company (PSNC), General Shipping Company (GSC), the great Compania Maritima (CM) provided Surigao with connection to Manila. Before the war, Surigao had ferry connection even in early American times and so the loss of connection was as shocking to me as the loss of Davao of its liner connection to Manila. I mean, the connections are historical and it was an epoch in local shipping. In 1954, when the country has basically recovered from the war and there were enough ships already, the Romblon and Basilan of Compania Maritima and the Davao and Vizcaya of Philippine Steam Navigation Company (PSNC) sailed to Surigao. These were augmented by the Fernando Escano of Escano Lines and the General Mojica of General Shipping Company. All of these passenger-cargo ships were former war-surplus “FS” ships used by the US Army in their Pacific campaign during the war. Ex-“FS” ships were the backbone of our passenger shipping fleet in the early Republic years. In 1955 the Occidental of Carlos A. Go Thong & Company and the Don Manuel of Royal Lines appeared in Surigao. Surigao then was usually paired with Butuan port (the true Butuan and not Nasipit) in voyages to increase the passenger and cargo volume. Combining the two ports was not difficult since the distance of the two is not far and just in the same direction and the additional passengers and cargo is much more than the additional fuel that is consumed. The routes combined with Surigao got more complex over the years. In some routes Surigao is combined with Masbate, the Samar ports and Tacloban. There was even a ship, the Vizcaya of PSNC that had the route Manila-Romblon-Cebu-Maasin-Cabalian-Surigao-Bislig-Mati-Davao (now how’s that for complexity?). If ever there is again a liner with such route again it will be offer good, free tourism. Never mind if the voyage takes one week as long as the accommodations, passenger service and food are good. By the way that was the time when a dozen passenger ships depart North Harbor every day on the way south. Who said smaller ships of the past were not good? With smaller ships comes more voyages and more voyages means more choices. Smaller ships also mean shorter legs and so it has to call on more ports. More ports means more free tourism. Never mind if the voyage takes long. If one wants shorter travel time there is always the airline. Some other routes to Surigao pass thru Cebu and/or ports on the western and southern side of Leyte island like Ormoc and Maasin. When I see the Palawan Princess or the Surigao Princess of Sulpicio Lines in the 1990’s and 2000’s, I tend to think they were the remnants of this route when they call in Masbate, Calubian, Baybay, Maasin and Surigao from Manila (and it even extended to Butuan earlier). It was just too bad that the suspension of Sulpicio Lines in 2008 put an end to that long route. Until 1959 there were six ships from Manila sailing to Surigao and these were the FS-167, Fernando Escano, General Segundo, General Roxas, Rizal and Romblon. All were ex-FS ships except for the Rizal which might have been a lengthened “F” ship. In 1964, Escano Lines increased its ship call to Surigao with the Tacloban and Kolambugan. Later when Sweet Lines became a national liner company they also called in Surigao with their Sweet Peace. Then in 1970 when Aboitiz Shipping Corporation fielded a dedicated ship to their origin, the West Leyte, this ship held a Manila-Romblon-Palompon-Ormoc-Baybay-Cabalian-Surigao-Sogod route. What a way to blanket western Leyte and Surigao! Later this route was taken over by their more modern ship Cagayan de Oro. In the same year, Go Thong had their Dona Gloria and Gothong (their flagship) do a Manila-Cebu-Surigao-Mati-Davao-Iloilo-Manila route which goes round Mindanao island. The two alternating ships of Go Thong were no longer ex-“FS” ships but were refitted former cargo-passenger ships with refrigeration from Europe which had air-conditioning already. When I think of the ship routes of the past, I see they were much more exciting that the dry, short routes of today where free tourism (touring the city while the ship is docked) is almost minimal. When Sweet Lines instituted their eastern Mindanao shortcutter route to Davao via Surigao their ships like the alternating Sweet Bliss and Sweet Dream were also former refrigerated cargo ships from Europe. Later, it was the Sweet Love and Sweet Lord which were alternating in this route. These ships were almost like in size as the Type “C1-M-AV1” war-surplus big ships used right after World War II but the difference is they were faster and had refrigeration which afforded air-conditioned first class accommodations and lounges to be built and hence were more comfortable than the big war-surplus ships that were converted to passenger-cargo use. With ships getting bigger, it is not surprising that routes and frequencies went down. If some thought that getting bigger is all a plus (like maybe in safety) then there is also a downside to that (and there might be a lesson there too). The ships getting bigger were probably the first that affected the frequency to Surigao. The factor came next maybe after that was the appearance of the fast cruiser liners in the second half of the 1970’s. Fast cruiser liners usually have just one intermediate call so that it can maintain a weekly voyage to a route as far as Southern Mindanao like Davao. With their appearance, other companies tried to speed up their voyages by also cutting down on intermediate calls and I think Surigao got affected by that like when Sweet Lines dropped Surigao on their eastern Mindanao seaboard shortcutter route. In 1979, when container services was just starting, the frequency to Surigao was down to 3 ships a week with two of that provided by Escano Lines with their Kolambugan and Surigao. The Don Manuel of Sulpicio Lines was the other ship to Surigao. The three were old ships, as in ex-”FS” type and the other probably a lengthened ex-“F” ship. I am not that sure of the reason for the drop except that I know ships on the way to Davao by the eastern seaboard no longer calls in Surigao port. I was thinking of the cargo. Were there a lot of logs, lumber and plywood loaded before? During that time the logging and timber industry was already on the way down. And the Catbalogan and Tacloban ships no longer go to Surigao. Not enough load maybe to extend the route there. Anyway, this time even the Catbalogan and Tacloban routes are already being threatened by the emerging intermodal system when the buses and trucks started rolling up to Leyte from Luzon. The end due to old age of the ex-”FS “ships definitely affected Surigao. Those type served the smaller ports and weaker routes in the 1970s. With just 1,000-horsepower engines they were certainly thrifty to run and their size fits the weaker and smaller ports especially with their shallow drafts. However, they can’t last forever and entering the 1980’s it was obvious they were already in their last legs as they were already in their fourth decade. By the middle of that decade only a few of those type were still running reliably and they were kept running by just cannibalizing parts from other similar ships, one of the reasons why their number kept steadily falling. Sulpicio Lines fielded the small but comfortable liner Surigao Princess in the route in 1983 which I said seemed to be a relic of earlier days. The Surigao Princess had air-conditioning and First Class accommodations including Suite. Aboitiz Shipping also resuscitated their complex route with their cruiser liner Legaspi which also had air-conditioning. This ship was acquired from Escano Lines, as the former Katipunan and different from their old Legazpi and sometimes she sports the name Legaspi 1 to differentiate it as the old Legazpi was still sailing. Maybe the ex-”FS” ships were now too old and slow to maintain such route. I am talking here of the late 1980’s. Escano Lines, the old faithful in the route and a “home team” of the area was already fading and what they had left were cargo ships and the Virgen de la Paz maintained their Surigao route for them. However, before Escano Lines was completely gone, Madrigal Shipping entered the Surigao route with their Madrigal Surigao, a comfortable and modern cruiser liner in an era when RORO liners were already beginning to dominate but then Madrigal Shipping lasted only a few years before quitting and selling their ships. I do not know if the regional ships also contributed to the decline of the Surigao liner route. They got better so much so that connecting to Cebu where great RORO liners were beginning to mushroom is already easy. One only has to check their schedules in Cebu and it is really nice to ride them and with their size they won’t be coming to Surigao and so connecting to Cebu might have become attractive so one can ride those great RORO liners. I am talking from experience but from a different city which is Iligan when it became an option to me to connect to Cebu to be able to ride a great liner. I also did that on the way home because I know that if I arrive before dark in Cebu there will be seamless connecting rides to Iligan and/or Cagayan de Oro. There was a big change in 1993 when the great Filipina Princess of Sulpicio Lines upon being shunted to Davao called in Surigao. Aboitiz Shipping also for a time tried the Surigao route with their SuperFerry 2. In 1994, William Lines entered Surigao for the very first time with their luxury liner Mabuhay 2. So for the first time the competitors in Surigao were all new and good liners, a development I have not ever seen before. Maybe the deregulation and support extended by the Ramos government was the reason when there was optimism and dynamism in shipping again. But let it be noted that the Surigao Princess which is beginning to be unreliable and the Palawan Princess were still alternating in their complex route to Surigao and so there were 4 voyages a week to Surigao then from Manila. In 1996, the SuperFerry 6 of WG&A, the former Our Lady of Akita tried to challenge the Filipina Princess in the Manila-Cebu-Surigao-Davao route. SuperFerry 2 also did a Manila-Surigao-Nasipit-Tagbilaran route after the merger. When WG&A started pairing ships in a route one pair that did the Manila-Surigao-Nasipit-Surigao-Manila route was the SuperFerry 3 and Our Lady of Medjugorje pair. When SuperFerry 6 was withdrawn from the eastern seaboard route and WG&A stopped that route and SF6 was paired with SuperFerry 10, the SuperFerry 1 and SuperFerry 8 was paired to do a Manila-Cebu-Surigao-Nasipit route and that was really a fast combination as both ships can do 20 knots. Later, when three-ship pairing was used by WG&A, the SuperFerry 2, SuperFerry 5 and SuperFerry 9 sailed the Manila-Surigao-Nasipit, v.v. route. I always thought WG&A will maintain a twice a week schedule to Surigao and pair it with Nasipit and Sulpicio Lines will always have two schedules a week with its unchanging routes and schedules. But of course with the sales of ships that transformed WG&A into Aboitiz Transport System (ATS) there will be uncertainties and the greatest change was when ats sold four of their newest liners to take advantage of good prices and earn a handsome profit. Coming at the heels of sales of older liners and container ships to pay off their former partners which withdrew from the merger, ATS suddenly lacked ships and the Surigao schedules became infirm. But the greatest blow was when Sulpicio Lines was suspended after the capsizing of their Princess of the Stars in 2008. Suddenly, their two schedules to Surigao were cut and those never came back. I thought ATS would be reliable but actually except for the return of SuperFerry 19 from Papua New Guinea, ATS found themselves lacking ships especially since their SuperFerry 14 was lost to firebombing off Bataan in 2004. When they acquired their SuperFerry 20 and SuperFerry 21, I thought that somehow their routes might stabilize. But like their withdrawal from Davao and General Santos City, I did not see that they will be doing just a Manila-Tagbilaran-Nasipit route and leave Surigao. This was the period when they had the system to use the buses i.e. give the passengers bus tickets to connect to their ships like what they did in southern Mindanao (so passengers can ride their liners in Cagayan de Oro). For Surigao, howeverm it seems they were offering their other makeshift system, the use of connecting ships to Cebu by using their Cebu Ferries. Neat but for whom? But then their subsidiary Cebu Ferries suddenly left to become the “Batangas Ferries”. What I saw was the ATS world collapsing and not out of financial trouble. They were just no longer that interested in shipping and they admitted as much. The passion was gone and they were already more interested in power generation. Well, their bet and support of Gloria Arroyo paid off handsomely and they were able to earn in Tiwi Geothermal and Mak-Ban in Laguna what they cannot possibly ever earn in shipping. They sold their shipping to an entity that was less capable than them and which had to get a big loan for the acquisition and was a big burden, so heavy that initially the new company was on the red for the next three years until fuel prices eased and they were back in the black. But that was not any benefit to Surigao as they never came back there for long except for a short period like when St. Joseph The Worker was refurbished and was assigned there and which I was lucky to ride. But after her sale and her sister it was downhill all the way for Surigao. With bean counters ruling, smaller ports had no chance in 2GO, the entity after ATS. And to think there were no longer any other liner company competing. 2GO was just content on routes that will easily make them money. Did they call that “serving the public”? I am not sure. Now Surigao no longer has a liner, not even one that is paired with Nasipit. But 2GO still call in Nasipit from Cebu and so the extra distance pays. But maybe not when paired with Surigao? Maybe if the hours and the fuel of the ship are measured the metric of Surigao is too low and the 2GO ship is better used elsewhere. That is the quintessential bean counter method. They are not into traditional shipping. They are into business. I was also wondering about the off and on service of the company to Dapitan until its total withdrawal. Dapitan and nearby Dipolog a combined population of over 200,000. But its commercial level is low and so maybe a population of 200,000 is not enough to sustain a liner per 2GO standard. And so maybe Surigao City with just 150,000 people has no chance even if some incrementals from Siargao tourism is added. In Ormoc with over a population over 150,000, 2GO was not able to maintain a route. Somehow these metrics points to the standards and parameters of 2GO. If that is correct then maybe Surigao has no chance really unless a new liner company with true shipping emerges. But then with the situation of the liner industry that is like asking for the moon. I don’t know if the change at the helm of 2GO with the entry of Chelsea Shipping and the SM Group if the metrics and priorities will change. If ATS and 2GO said they were “passionate” in shipping (of course their dictionary is not Webster), I don’t know what will be the adjective of the 2GO/NN-Chelsea-SM combine that will make it better. I don’t want to be too hopeful and so I will just await developments. Note: Thanks a lot to the research of Gorio Belen in the National Library. In the era of cruiser liners, not only did they get bigger but they also got faster. So they competed not only in amenities and passenger service but also in shorter cruising times and this was valuable not only in the far ports like Davao but also in the likes of Cebu and Cagayan de Oro. With fast cruisers, the travel time to the likes of Davao went down from three-and-a-half days to two-and-a-half days. It also brought down the cruising time to Cebu to less than a day. The leading shipping company in the local routes Compania Maritima had been the first in fast cruisers with the fielding of “Filipinas” in the 1968 and the “Mindanao” in 1970. Both were capable of 18 knots and that was the reference speed then in that era to be considered “fast”. As expected, the two, one after the other. were fielded in the long Davao route. William Lines followed suit from 1970 when they ordered the brand-new “Misamis Occidental” that was also capable of 18 knots. This was soon followed by the legendary “Cebu City” which was capable of 20.5 knots and this was assigned to the premier Manila-Cebu route. William Lines then followed up with four more fast cruiser liners and they had the biggest number of ships in that category. William Lines fielded their 20.5-knot “Manila City” to the Davao route. Sweet Lines did not really have a fast cruiser except for the first “Sweet Faith” which they fielded in the prime Manila-Cebu route in a fierce competition with William’s “Cebu City”. This liner which arrived from Denmark in 1970 was capable of 20 knots. She had the pair “Sweet Home” (the first) which came in 1973 from Europe too. Sweet Lines dubbed the two as the “Inimitable Pair”. To be able to compete in the long Davao route, what Sweet Lines did was to use the shorter eastern seaboard on the route to Davao. With this tactic, they were also “fast”, so to say. Negros Navigation also had their share with fast cruiser liners with the “Dona Florentina” and the beautiful “Don Julio”. This was capped by their fastest cruiser then, the “Don Juan” which was capable of 19 knots. A later ship, the “Don Claudio” was also fast at 18.5 knots when she was still in Japan. May I note that the Negros Navigation cruiser liners were not really in direct competition with their counterparts as they were just then in the Western Visayas routes. The fragments of the Go Thong empire was late in fast cruiser liner segment. Maybe they needed to take stock and consolidate after their split in 1972. Sulpicio Lines entered the fast cruiser liner category just in 1975, the last among the majors which competed in this field. It has to be noted that Carlos A. Gothong Lines and Lorenzo Shipping did not follow in this category and neither did Aboitiz Shipping and Escano Lines. Only Compania Maritima, William Lines, Sweet Lines, Negros Navigation and Sulpicio Lines participated in this competition but actually Compania Maritima did not acquire any more liners, fast or not, after acquiring “Mindanao” in 1970 even though they had many hull losses in the succeeding years. Sulpicio Lines acquired the “Himeyuri Maru” from Ryukyu Kaiun KK, more famously known as RKK Line in 1975. This ship was built by Onomichi Zosen in Onomichi yard in Japan in 1963. She measured 93.1 meters by 13.6 meters and her cubic volume was 2,602 gross tons. She was powered by a single Niigata engine of 5,500 horsepower and her top speed was 18 knots. Refitted in the Philippines she had a passenger capacity of 1,424. She was given the name “Don Sulpicio” in honor of the founder and she became the flagship of Sulpicio Lines (this was the second ship to carry that name in the fleet). In 1981, after a fire and refitting she was renamed the “Dona Paz”, the second to carry that name in the Sulpicio Lines fleet (the first was an ex-FS ship). A fine ship, she was unfortunately associated with great ignominy later. In 1976, Sulpicio Lines acquired the sister ship of “Himeyuri Maru” from RKK Lines too, the “Otohime Maru” which was also built by Onomichi Zosen in the same yard in Onomichi, Japan three years later in 1966. She had the same Niigata powerplant of 5,500 horsepower. However, she was rated at 19.5 knots. She was 97.6 meters in length, 13.7 meters in breadth with a cubic volume of 2,991 gross tons. This ship was renamed to “Dona Ana” and together with “Don Sulpicio”, Sulpicio Lines called them the “Big Two”. They were used by Sulpicio Lines in fighting for their stake in the primary Manila-Cebu route. Later, they extended the route of “Dona Ana” to Davao. In 1980, “Dona Ana” was renamed to “Dona Marilyn”. She held the Manila-Iloilo-Zamboanga-Cotabato route of Sulpicio Lines until she was reassigned the Manila-Catbalogan-Tacloban route with the arrival of the “Cotabato Princess”. She held that route until her end. In 1978, as Sulpicio Lines grew stronger, they acquired from RKK Lines again not one but two ships which were actually sister ships too but bigger than the earlier pair from Ryukyu Kaiun KK. These were the “Tokyo Maru” and the “Okinawa Maru” and again both were built by Onomichi Zosen in Onomichi yard in Japan. The first ship was built in 1969 and the second one was built in 1973. The “Tokyo Maru” had dimensions of 112.2 meters by 15.2 meters and she had cubic measurement of 3,510 gross tons. She was powered by a single Hitachi-B&W engine of 6,150 horsepower which gave her a top speed of 18.5 knots. “Okinawa Maru” measured 111.5 meters by 15.2 meters with a cubic volume of 3,800 gross tons. Her engine was a single Mitsubishi-MAN of 7,600 horsepower which gave her a top speed of 19 knots. Incidentally this engine also powered “Cotabato Princess”, “Nasipit Princess”, “SuperFerry 2”, “SuperFerry 5” and “Cagayan Bay 1”. “Tokyo Maru” was renamed to “Don Eusebio” and “Okinawa Maru” was renamed to “Don Enrique”. When the “Princesses” came into the nomenclature of Sulpicio Lines she became the “Davao Princess” in 1987 because she was actually the Davao specialist. Later, she was renamed to “Iloilo Princess” when she was no longer holding that route (“Filipina Princess” supplanted her in 1993). Her local passenger capacity, as refitted was 1,379. Meanwhile, “Don Eusebio” was renamed to “Dipolog Princess”. She was then sailing the Manila-Dumaguete-Dipolog-Cagayan de Oro-Ozamis route. However, she was not actually calling in Dipolog but in Dapitan port. In her refitting here, her passenger capacity increased to 1,261. Later, she held the Manila-Tagbilaran-Dipolog-Iligan-Cebu route of the company until she was stopped from sailing. The fifth and last cruiser Sulpicio Lines acquired in this period was the “Naha Maru” which also from RKK Line and she came in 1981. She was bigger than the earlier ships from RKK Line. The ship was built by Onomichi Zosen (again!) in Onomichi yard in Japan in 1972. She measured 130.9 meters by 16.8 meters and she had a cubic measurement of 4,957 gross tons. She was powered by a single Hitachi-B&W engine of 9,200 horsepower, the same type powering “Dipolog Princess” but with more cylinders. She had top speed of 20 knots when new. She was called as the “Philippine Princess” and she became the Sulpicio Lines flagship which means she held the Manila-Cebu route. For a long time, she and the William Lines’ flagship “Dona Virginia” fought in that route. Refitted here, she had a passenger capacity of 1,633. As a footnote, much later, when cruiser liners were no longer in vogue, Sulpicio Lines acquired another fast cruiser liner. This was the “Ogasawara Maru” of Tokai Kisen which was built by Mitsubishi Heavy Industries in Shimonoseki, Japan in 1979. She measured 110.5 meters by 15.2 meters and 3,553 gross tons. She was powered by two Mitsubishi engines totalling 11,600 horsepower and her top speed when new was 20.5 knots. She was known as the “Princess of the Caribbean” here and she came in 1997. Like the William Lines fast cruiser liners, many of these Sulpicio fast cruiser liners also met grim fates (but in general they lasted longer and that is why the PSSS — Philippine Ship Spotters Society have still photos of them). Everybody knows the fate of “Dona Paz” which collided with a tanker in Tablas Strait on December 20, 1987 that resulted in great loss of lives. The “Dona Marilyn”, meanwhile, foundered in a typhoon off Biliran on October 24, 1988 on her way to Tacloban from Manila. The “Philippine Princess” was hit by fire while refitting in Cebu on December 5, 1997. She was towed to Manila where she was broken up. The “Iloilo Princess” was hit by another fire while also refitting in Cebu on July 4, 2003. She capsized in port and she was broken up, too. The “Dipolog Princess” was the only survivor of the five. She was among the Sulpicio Lines ships suspended as a consequence of the capsizing of the “Princess of the Stars” in a typhoon in June of 2008. She never sailed again and she was just anchored in Mactan Channel and later moored at the Sulpicio wharf in Pier 7 in Mandaue, Cebu. Together with the “Princess of the Caribbean” she was sold to China breakers and she was demolished in Xinhui, China by Jiangmen Yinhu Ship Breaking Company on January 2011. Now, even Sulpicio Lines is no more. Tacloban City is the regional commercial center of Eastern Visayas and this has been so for about a century now. It has the advantage of a central location and a sheltered port and bay. Its reach weakens, however, in the western coast of Leyte which has its own sea connections to a greater trade and commercial center, the great city of Cebu which has been ascendant in the south of the Philippines since half a millennium ago. As a regional commercial center, it is but natural for Tacloban to have a great port with trade routes to many places. That has been the situation of Tacloban since before World War II and even before World War I. It also does not hurt that Tacloban is the capital of the province of Leyte. In fact, because of her superior strategic location, Tacloban even exceeded her mother town which is Palo which is still the seat of the church hierarchy. Before World War II and after that, passenger-cargo ships from Manila will drop by first in Masbate, Catbalogan and Calbayog before hooking route and proceeding to Tacloban. Some of these ships will then still proceed to Surigao and Butuan or even Cagayan de Oro using the eastern seaboard of Leyte. Tacloban then was the fulcrum of these liner routes going to Eastern Visayas. That route was much stronger than the routes that drop by Ormoc and Maasin and perhaps Sogod and Cabalian before going to Surigao. The two routes were actually competing (like Ormoc and Tacloban are competing). If the route via Tacloban was stronger it is because Tacloban was the trade and commercial center of the region. At its peak, Tacloban port hosted some seven passenger-cargo ships from Manila per week from different liner companies. She also had daily regular calls from passenger-cargo ships emanating from Cebu. There were also some ships that originate from as far as Davao which dropped by Surigao first. Such was the importance of Tacloban port then which can still be seen in the size of Tacloban port and the bodegas surrounding it. There were many liner companies that called over the years in Tacloban from Manila. Among them were Sulpicio Lines (and the earlier Carlos A. Gothong & Co.), Compania Maritima, General Shipping Company, Philippine Steam and Navigation Company, Philippine Pioneer Lines (and later the successor Galaxy Lines), Escano Lines, Sweet Lines, even the combined Carlos A. Gothong Lines Inc. and Lorenzo Shipping Corporation. 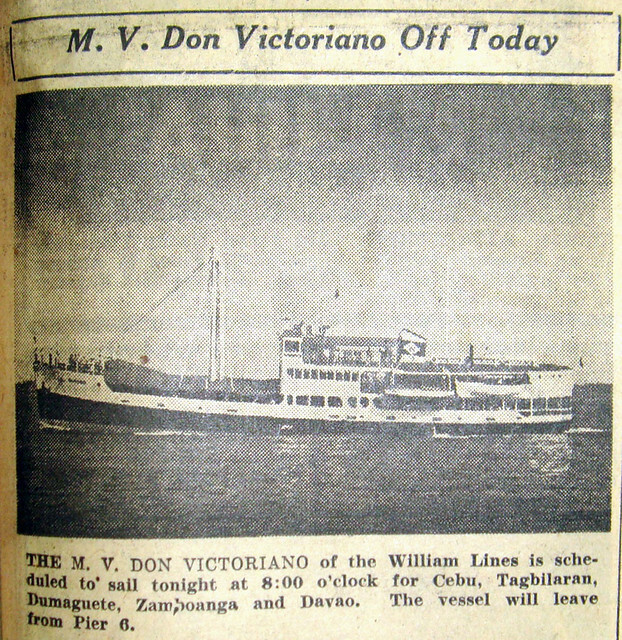 When it was still sailing local routes, even De la Rama Steamship served Tacloban. Among the minor liner companies, Royal Lines Inc., Veloso Brothers Ltd., N&S Lines, Philippine Sea Transport and Oriental Shipping Agency also served Tacloban. Not all of those served at the same time but that line-up of shipping companies will show how great was Tacloban port then. For many years there was even a luxury liner rivalry in Tacloban port. This was the battle which featured the Dona Angelina of Sulpicio Lines and the Sweet Rose of Sweet Lines which mainly happened in the 1970s. Sweet Rose was sailing to Tacloban from the late 1960s and was in fact the first luxury liner to that port. The two liners were the best ships then sailing to Tacloban port. The rest, of course, were mainly ex-”FS” ships which was the backbone of the national liner fleet then and there was no shame in that. Tacloban port was doing well until the late 1970’s when a paradigm change pulled the rug from under their feet. This development was the fielding of a RORO by Cardinal Shipping, the Cardinal Ferry I that connected Sorsogon and Samar. With San Juanico bridge already connecting Samar and Leyte and the Maharlika Highway already completed, intermodal trucks and buses started rolling into Tacloban and Leyte. In fact, in just one year of operation the intermodal link was already a roaring success with many trucks and buses already running to Manila. Soon other ferries were connecting Sorsogon and Samar including the Maharlika I of the government. With this development the irreversible decline of Tacloban port began. It was a slide that never ever saw a reversal because what happened over the years was the buses and trucks rolling to Tacloban and Leyte just continued to multiply without abatement (and the ROROs in San Bernardino Strait also increased in number). Soon the passengers were already filling the intermodal buses and freight except the heaviest and the bulkiest was also slowly shifted to the trucks. Over the years the number of passenger ships to Tacloban slowly declined as a consequence. In the late 1980’s, when the pressure of the intermodal was great there were still three national shipping lines with routes to Tacloban – Sulpicio Lines, William Lines and Sweet Lines. In the early 1990’s. when Sweet Lines quit shipping only the top two shipping lines then where still sailing to Tacloban with the Tacloban Princess of Sulpicio Lines and the Masbate Uno of William Lines. Incidentally, the infamous Dona Paz which burned and sank after a collision with a tanker in December 1987 originated from Tacloban. When the WG&A merger came in 1996 the company pulled out the Masbate I from the Tacloban route. The last liners ever to sail the Tacloban route were the Tacloban Princess and the Cebu Princess which alternated in the route. Both belonged to Sulpicio Lines. The liner route from Manila to Tacloban was finally severed when Sulpicio Lines got suspended from passenger service as a consequence of the sinking of the Princess of the Stars when both the Tacloban Princess and the Cebu Princess were sold. The overnight ferry service from Cebu almost followed the same path and died at almost the same time. The last three shipping companies which had a route there were Roly Shipping, Maypalad Shipping and Cebu Ferries Corporation (which was the successor of CAGLI). But passengers slowly learned that the routes via Ormoc and Baybay were faster and cheaper and the connection was oh-so-easy as the bus terminals of the two cities were just outside the port gates of Ormoc and Baybay. The High Speed Crafts (HSCs) to Ormoc, mainly SuperCat and Oceanjet also made great strides and captured a large portion of the passenger market and it further denied passengers for Tacloban. With the HSCs and overnight ships from Cebu that leave Ormoc in the morning there was no longer any need for Tacloban passengers to wait until night. The last rope for Tacloban port passenger-cargo ships was cut when the new coastal highway from Basey, Samar to Guiuan, Eastern Samar was completed. With that the passenger ships connecting Tacloban and Guiuan had to go as the fast and ubiquitous commuter vans (called “V-hire” in the province) suddenly supplanted them. Trucks also began rolling and some of these were even coming from Cebu via the intermodal. Now only a few cargo ships dock in Tacloban port. There is still one cargo shipping company based in Tacloban, the Lilygene Sea Shipping Transport Corp. Gothong Southern Shipping Lines meanwhile still has a regular container ship to Tacloban but there are complaints that the rates are high (the consequence of no competition). Whatever, there are still cargoes better carried by ships than by trucks. However, some of the container vans for Leyte are just offloaded now in Cebu and transferred through Cargo RORO LCTs going to several western Leyte ports. What might remain for a long time maybe in Tacloban port are the big motor bancas for Buad island in Western Samar which hosts the town of Daram and Bagatao island which hosts the town of Zumarraga. I am not sure of the long-term existence of the other motor bancas for the other Samar towns except for maybe Talalora as more and more they have buses that go to Tacloban and maybe soon the commuter vans will follow. Or maybe even the jeep. The lesson is with roads established the sea connection always have to go in the long term. Tacloban port is improved now. Improving the port eases port operations but it will not make the ships come back contrary to what the PPA (Philippine Ports Authority) and the government say. It is cargo and passengers that make the ships come to a port but if there are other and better transportation modes that are already available then cargo and passenger volumes drop and sometimes it becomes uneconomical for the ship to continue operating. So I really wonder what is the point in developing a port in the nearby town of Babatngon as an alternative to Tacloban port. Have the Philippine Ports Authority ever asked who wants to use it? It is not surprising however as the PPA is the master of creating “ports to nowhere” (ports with practically no traffic) especially in the time of Gloria Macapagal Arroyo who was so fond of those (for many “reasons”, of course). In the past two decades the PPA always touted Tacloban port. For maybe they are based there. There was a denial that actually Ormoc port was already the main gateway to Leyte and it is no longer Tacloban port. Recently however, there seems to be an acknowledgment of the real score — that Ormoc port has actually been the de facto gateway already. The government is now developing Ormoc port and it is good that the PPA vessel arrival and departure site already covers it. Whatever and however they try, it cannot be denied that the sun is already setting in Tacloban port. It is no longer the same port it used to be in the past because of the intermodal assault changed things. Like they say, things always change. Among the major liner companies, I found William Lines Incorporated striking in some ways. First, in their early days they were very loyal to the former “FS” ships as in they were operating no other type in their first 20 years. Others like Bisaya Land Transport was also like that but they were not a major liner company. Some other majors that initially had a pure ex-”FS” fleet like the General Shipping Company acquired other types earlier than William Lines. Yet, even though they just have a pure ex-”FS” fleet which were small and slow ships that looked vulnerable, William Lines stressed the southern Mindanao routes (Dadiangas and Davao) that needed two ships alternating just to maintain one weekly schedule as a voyage takes nearly two weeks to complete. This is the second striking characteristic I noticed in their history, the stress in southern Mindanao. In fact, because of the weight demanded on a fleet by the southern Mindanao route most of our liner companies then did not enter the southern Mindanao route. Only three others aside from William Lines did Southern Mindanao routes. Three other companies did this route for decades — Compania Maritima, Philippine Steam and Navigation Company (PSNC) and Carlos A. Go Thong & Company. The first two were big companies in those days. Manila Steamship Company (Elizalde y Compania) also did the southern Mindanao route before they quit shipping in 1955. It was also a big company. De la Rama Steamship also sailed southern Mindanao routes before they quit local shipping in the early 1950’s. William Lines started shipping sometime at the tail end of 1945. Everyone knows the company is named after the founder William Chiongbian. And the first ship of the company, the Don Victoriano was named after the father of William Chiongbian. Subsequently, in its first decade, the ships of William Lines were named after his sons and daughters. Jimenez, Misamis Occidental is the place of origin of William Lines. Actually, William Chiongbian did not start from zero. His father already had trading ships before World War II in support of their copra business. That was normal then before the war. Others that made it big in shipping after World War II had similar origins like Carlos Go Thong and Aboitiz (but the latter was already big even before the war). The route system then of William Lines was very simple. 6 ships in 3 pairs will do a thrice a week Manila-Cebu-Tagbilaran-Dumaguete-Zamboanga-Davao voyages leaving Manila on Tuesdays, Thursdays and Saturdays. The rest of the fleet will do a once or twice a week sailing to Panguil Bay (Iligan and Ozamis plus Dumaguete) via Cebu. Was there a route system more simple than that? It might be simple but actually William Lines was a beneficiary to the growth of traffic to southern Mindanao with the opening of the island to exploitation and colonization by Christians from the rest of the country. The routes to that part of the country were those that grew consistently over the years because of the big increase in population brought about by migration of people. With that came goods and produce that need to be transported. Actually except for Manila Steamship which quit shipping early after the shock of losing their flagship Mayon to fire and explosion in 1955, all those that stayed in the southern Mindanao route lived long (the Compania Maritima quitting was another story). Many that did short routes from Manila even had shorter life spans like Southern Lines, General Shipping Company and Madrigal Shipping. The southern Mindanao area with its continuously growing production and trade buoyed the shipping companies that stayed there. The other ships of William Lines in this period were Elena (which later became Virginia VI and Don Jose I), Elizabeth, Edward, Albert (which also became known as Iloilo City), Victor, Henry I and Grace I (which also became the first Manily City). All including the Don Victoriano (which became the second Elena) had their hulls subsequently lengthened to increase capacity. That was needed for the growing traffic and cargo in the routes of William Lines. Within its first two decades, in 1961, William Lines also purchased the Kolambugan of Escano Lines. It was used to open a Cagayan de Oro route for the company and she was fittingly renamed as the Misamis Oriental. From Cagayan de Oro the ship also called in Iligan and Ozamis. Also acquired that year was the Davao of A. Matute which became the Davao City in the fleet of William Lines. That same year the FS-272 of Philippine Steam and Navigation Company was also acquired and this became the Don Jose in their fleet. In 1963, the President Quezon of Philippine President Lines was also acquired and the ship became the Dona Maria in the fleet. At its peak the William Lines passenger fleet consisted of 11 former “FS” ships. However, I am not sure if the latter additions were all lengthened. In 1966, William Lines acquired their first liners that were not former “FS” ships when they also began acquiring big former passenger-cargo ships from Europe like Go Thong and Compania Maritima. That was the new paradigm then and they were able to latch into it. It was a response to the growing need for additional bottoms when surplus ships were not yet available from Japan in great numbers. That was the early history of William Lines, the tale of their first 20 years in shipping. Their growth into first rank will come after their first two decades until for a brief period they might have been Number 1 in local passenger shipping. By the way, they had no ship losses in their first two decades. And that was pretty remarkable given the rate of liner losses over the decades and even in the modern era. Maybe somebody should do a study what was their safety secret then. The usual length of an unmodified ex-”FS” ship is 53.9 meters with a breadth of 9.8 meters and a depth of 3.2 meters. The Gross Register Tonnage (GRT), a measure of the ship’s volume is usually 560 tons. The years 1965 and 1966 witnessed key developments and shifts in Philippine shipping. In those two years, two liner companies quit the local passenger liner shipping scene. These are the General Shipping Company and the Southern Lines Incorporated which both started right after the end of World War II when the US began transferring to us war-surplus ship. Thus the fleet of General Shipping Corporation and Southern Lines Incorporated consisted mainly of converted ex-“FS” ships. General Shipping, however, has two local-built luxury liners, the General Roxas and the General del Pilar. Southern Lines, meanwhile has one local-built luxury liner, the Governor B. Lopez plus the Don Julio from Ledesma Shipping Lines which was an ex-”FS” ship refitted to have luxury accommodations and was fast as she had former submarine engines. The rest of the fleet of the two shipping companies were run-of-the-mill passenger-cargo ships of the time except that Southern Lines had a significant number of the smaller ex-“F” ships in their regional routes. General Shipping had a fleet of a dozen liners and it had routes to all over the Visayas but it barely touched Cebu and Mindanao. Meanwhile, Southern Lines’ routes were mainly concentrated in Western Visayas and Romblon. It was the “Negros Navigation” of that region during that time, in effect, because Negros Navigation was just practically a regional operation then and they began as a postwar liner company when Southern Lines went out of the liner shipping scene. The fleet of Southern Lines was just as big as General Shipping but as said earlier a significant number of it was in the regional routes and those were mostly former “F” ships that were a little small for liner use unless lengthened like what was done by Carlos A. Gothong & Co. and others. How did the national shipping scene stack up in those years? Well, in 1966, there was a near-parity between Compania Maritima, Philippine Steamship & Navigation Company (PSNC) and Carlos A. Gothong & Co. in the inter-island routes. Let me clarify that not counted here were their ships in the international routes. In ranking the shipping companies, Compania Maritima was a little ahead with Philippine Steamship & Navigation Company coming in second and Carlos A. Gothong & Co. trailing in on third. They were the first pack, so to speak as the fleet of the other liner shipping companies were a significantly behind them. If a fourth place will be awarded it will actually go to General Shipping Company. And a fifth place will have to be claimed by William Lines Inc.. This reckoning considers not only the number of ships but also the sizes of the ships as well as if the company has a luxury liner. Two liner shipping companies quitting at nearly the same time will trigger realignments as they won’t simply go away as their ships and franchises will go to other shipping companies and that has always been the case. In this particular case their quitting of the General Shipping and Southern Lines not only produced realignments but also births and rebirths two three shipping companies. With the purchase of ships and franchises from General Shipping, Aboitiz Shipping was reborn with an independent operation in 1966. And besides that, a little later, they were also able to establish the Cebu-Bohol Ferry Company (CBFC), a shipping company that has no Bohol port of call from Manila but has regional operations. To bolster their fleet, Aboitiz Shipping also purchased two ex-”FS” ships from Philippine Steamship & Navigation Company (PSNC), the Baztan and FS-165. Maybe the two belonged to them anyway as part of their partnership with PSNC. As clarification, the ships acquired from General Shipping did not immediately begin sailing as those were lengthened first locally and refitted. Lengthening of former “FS” ships was a common practice in the 1960’s. Since Aboitiz Shipping Company, Cebu-Bohol Ferry Company and Philippine Steamship and Navigation Company had combined operations, for the first time after the war there is a shipping combine with more ships total than the leader Compania Maritima. However, the fleet of Aboitiz Shipping Company, Cebu-Bohol Ferry Company and Philippine Steamship and Navigation Company consisted mainly of ex-“FS” ships while the majority of Compania Maritima’s fleet consisted of big ships from Europe and so in terms of Gross Register Tonnage (GRT), an established way of calculating fleet size, Compania Maritima was still ahead. And besides, they have liners in the foreign routes that can also be used for the local routes if those were around. Sweet Lines Incorporated of Bohol, which was formerly a big regional shipping company in Central Visayas, Eastern Visayas and Northern Mindanao was able to acquire the same number of ships as Aboitiz Shipping from General Shipping Corporation. With the franchises that went along with the ships, Sweet Lines was able to open routes to Manila and for the first time they became a liner shipping company. Meanwhile, General Shipping Company swapped their luxury liner General del Pilar for an ex-“C1-M-AV1” ship Compania Maritima, the Mactan to use it in their international routes. Sweet Lines, however, was able to acquire one of the luxury liners of General Shipping, the General Roxas which became the Sweet Rose. That was the total picture now of how the local fleet of General Shipping Corporation was cut up after it quit the local shipping scene. The exit of the other shipping company, the Southern Lines Incorporated also had dramatic aftermaths. With the exit of Southern Lines Incorporated, it was full steam ahead for Negros Navigation Company to become a full-pledged liner shipping company as Western Visayas needed a successor liner company in their place. However, unlike the others which relied at this time with surplus ships from Europe, Negros Navigation built their fleet not by taking over the fleet of Southern Lines but by ordering brand-new liners from Japan starting with the Dona Florentina in 1965 (or with the Princess of Negros of 1962 that was ordered from Hongkong which succeeded the Don Julio, the ex-”FS” ship which went to Southern Lines). [In fact, none of the ships of Southern Lines ended up with Negros Navigation.] The routes and ports of call of Southern Lines and Negros Navigation were almost exactly the same. Take note that the Board of Directors of Southern Lines and Negros Navigation have an intersection and both belonged to the crème de la crème of Iloilo and Negros. The succession of Southern Lines to Negros Navigation was just like a baton passed by a runner to a fellow runner. The demise of the fleet of Southern Lines did not produce a big realignment in the fleet of others. Firstly, 2/3 of the fleet of Southern Lines were ex-”F” ships which were not liners in the first place. Secondly, the remainder of its fleet, the liners, their major ships were divided almost equally by the other shipping companies. Carlos A. Gothong & Co. got the best, the only luxury liner of Southern Lines which was the Governor B. Lopez which became the first liner of Carlos A. Gothong & Co. with airconditioning, the Dona Ana in their fleet. Another which is better and than the ex-”FS” ships went to Sweet Lines as the Sweet Sail. Two of the liner ships of Southern Lines went to the regional shipping company Visayas Transportation so it did not matter in the national shipping balance. For a very short time Compania Maritima and PSNC+Aboitiz Shipping Comp.+Cebu-Bohol Ferry Company was ahead from the others. However it was very short lived since Carlos A. Gothong & Co.’s surplus ships from Europe began arriving in greater numbers starting in the mid-1960’s. William Lines likewise copied that model and also began purchasing surplus ships from Europe to be converted into liners here. Actually PSNC+Aboitiz Shipping Comp.+Cebu-Bohol Ferry Comp.’s share of the lead was tenuous as most of their fleet consisted of war-surplus ships from the US that were beginning to get old and are more prone to accidents. Meanwhile, from 1967 the “suicide” of Compania Maritima’s ships began. So, two liner shipping companies died in the mid-1960’s (actually General Shipping Company shifted to international routes like Ledesma Shipping Co. which had a merger with Negros Navigation earlier) but in their place three liner shipping companies emerged – Aboitiz Shipping Company, Cebu-Bohol Ferry Company and Sweet Lines Incorporated although one is a subsidiary of the other. Those were the major developments in Philippine liner shipping in the mid-1960’s. That then shaped the liner shipping scene in the Philippines in the next years. Right after World War II, the former FS ships of the US military dominated the Philippine shipping industry. FS means “Freight and Supply”. Their earlier designation was “FP”. The FS series is one of the many types of transport-supply ships used by the US armed forces in World War II. The FS ships proceeded from one basic design, with variations. There were many contracted shipbuilders in the US that built them. Higgins Industries and Wheeler Shipbuilding were the dominant FS shipbuilders. The FS ships that reached the Philippines were about 54 meters in length with a beam of 9.8 meters. It is about 560 gross tons. Many manufacturers supplied engines for the FS ships from the basic General Motors-Cleveland design. The bulk of the FP/FS ships were built in the year 1944 and a few were built in 1945. Most were built for the US Army and it was mainly employed in the Pacific theater of operations of the US armed forces. That was one of the reasons why so many FS ships found its way to the Philippines. As military surplus ships which the US no longer needed anymore after the war, the FS ships were plenty, readily available and very cheap. Many were just given as reparations for the ships requisitioned by the US during the war or were replacements for the ships that were deliberately scuttled during the early phase of the Pacific war to prevent them from falling into enemy hands. The first batch that came was directly given to the Philippine government for its disposal. Later, some FS ships given to other countries found its way to the Philippines, mainly in the 1950’s and these were private transactions. Even much later, some former FS ships converted by the US Navy for post-war uses (the “AKL” series) found its way to the Philippines as late as the 1960’s. This batch was cornered by the well-connected Philippine President Lines. Some of FS ships were used unconverted and served as cargo ships carrying a few passengers. Most, however, were converted to true passenger-cargo use. About half were later lengthened in Hongkong and Bataan shipyards and some were even re-engined. Aboitiz Shipping Lines and William Lines were notable for this. Converted and/or lengthened FS ships added passenger decks and accommodations. But compared to later standards those were still very spartan and meager. Third-class was really hardship class as one has to sleep among the cargo in the lowermost deck which is hot and noisy as it was just above the engine deck. Second class accommodations meant foldable cots and being located a deck above third class. First class is usually located in the bridge deck and is not accessible by the other classes. However, for all classes air-conditioning is non-existent. Originally running at 12-13 knots, converted FS ships generally ran at 10-11 knots and sometimes even slower as they aged and got heavy. A route in general had many ports of call with long in-port hours due to the slow loading and unloading operations using porters and booms. Southern Mindanao voyages took two weeks to complete, round-trip. Visayas and northern Mindanao routes took one week. In a few short routes to Panay, Palawan, Mindoro, Romblon and Marinduque, a twice a week sailing was possible. The FS ships generally didn’t have radar and ship masters became versatile in reading the weather and in looking for coves to take cover when the waves became rough for comfort and safety. The FS ships were known for rolling in heavy seas and being slow it cannot outrun a coming typhoon. Many were caught in the seas by storms and foundered or were wrecked. The FS ships served longer than they were intended or expected to. Most were still sailing in the 1970’s and having completed three decades of service. But by the 1980’s, only the sturdiest of the class survived. A few of the FS ships served until the early 1990’s. It is a matter of conjecture which was the last FS ship sailing in our waters. That FS ship was probably a vessel running cargo somewhere among the lesser-known routes. Usually death of the engine is the main cause of the retirement of the FS ship. Others were retired because they were no longer competitive in terms of speed and comfort. Many long-surviving shipping companies sold and broke up FS ships late in its life to be able to buy newer replacement ships. However, other lesser companies sold and broke up ships in the economic crisis of the mid-1980’s and went out of the shipping business. By the mid-1990’s, the FS ships were already history. At the age of 50 even the sturdiest of machineries begin to fail and can no longer be retrofitted. Radar and air-conditioning, musts of the 1980’s can no longer be retrofitted in the FS ships. Nor can they be made to run any faster. As a whole, the FS ships did not suffer from leaky bottoms or holed hulls. In general, they proved to be sturdy and reliable. The FS ships were one of the most significant types of ships to serve Philippine shipping. In the first 15 years after World War II there was not much of what was later called “the flagship wars”. How can there be flagship wars when it was an ex-”FS” ship battling another ex-”FS” ship? The ex-“FS” ship were just small World War II surplus ships from the US Navy that were slow and lumbering just like the freighters. And with the basicness of the ex-”FS” ships, there was really no “luxury” to talk about when there was no airconditioning, no real amenities, no entertainment (unless one brings out a guitar and croons), no true lounges or even enough space to walk about. There were bigger ships like the Type C1-M-AV1 which were also war surplus ships from the US Navy but they were also basic ships and also lack speed (both the two mentioned types only sail at about 11 knots which was also the sailing speed of the general cargo ships). As general rule, cargo ships converted for passenger use do not produce luxury liners. If ever, it would be the former refrigerated cargo ships that can be made into luxury liners or else the best is to buy former luxury liners from Europe. The Manila-Cebu route was and is still the premier shipping route in the Philippines. This route connects the primary metropolis and manufacturing center to the secondary metropolis and manufacturing center of the country. Hence, the movement of people and goods would be highest in this route. If there is a next premier route it would be the Manila-Iloilo route. The Manila-Cebu route is also the gateway to the routes to Northern Mindanao while the Manila-Iloilo route is the gateway to the routes to Western Mindanao and Southern Mindanao. When luxury liners first came they funnily have the code “airconditioned” (airconditioning was rare then). And the word “luxury” also began to be bandied about. In terms of speed they were significantly better than the basic ex-”FS” ships and ex-”C1-M-AV1” ships. Some of the earliest local liners were the trio from Everett Steamship being sailed by Philippine Steamship and Navigation Company (PSNC), the Elcano, Legaspi and Cagayan de Oro which all came in 1955, the Luzon (1959) and Visayas (1963) of Compania Maritima which were doing dual local and foreign routes, the General Roxas (1960) and General del Pilar (1961) of General Shipping Corp., the President Quezon (1960) of Philippine President Lines (which became the Quezon of Philippine Pioneer Lines in 1963 and later the Pioneer Iloilo of the same company in 1965), the Governor B. Lopez (1961) of Southern Lines Inc., the Fatima of Escano Lines (1964). If one will notice, there is no mention here of a ship of Go Thong & Co. or William Lines and definitely there is no error in the list. In that roost, the President Quezon ruled in speed department at 18 knots and the next fastest to her sailed at only 16 knots with the tailender at 12 knots which was just about the same as the ex-”FS” ships and the ex-”C1-M-AV1” ships. That was the picture of the luxury ship sector of the Philippines two decades after World War II. In that era, there was no “flagship wars” as understood a decade later. Maybe if the better ships were all doing long routes it will be a wonder where and how they will compete. This is especially true for the luxury liners sailing to Cebu and then proceeding to many southern ports up to Davao. I noticed the tight “flagship wars” started only when there were already true fast cruisers and when the route was exclusively limited to Manila-Cebu. It was Sweet Faith of Sweet Lines, a newcomer in liner shipping which started the true “flagship wars” in 1970. They were able to acquire that ship which was a luxury liner even in Europe and she was really fast. When she came she became the new postwar benchmark in speed at 20 knots and beating handsomely all the other contenders by at least 2 knots. Maybe she only did the Manila-Cebu route because she had to stress the capture of passengers because she can’t take in a significant amount of cargo. And with her accommodations all-airconditioned that was really more fit for the Manila-Cebu route which not only had more sector passengers and the better-off passengers were also there including the Cebu and Central Visayas rich who were afraid to take planes then. With such a kind of ship Sweet Lines really had to stress in ads her speed, her amenities and her brand of passenger service to capture more passengers. She was very successful in that strategy and her repute spread far and wide and she earned many praises. It was really a paradigm change in how to do sailing and maybe that was a little too much for the older shipping companies to swallow the noise and swagger of the newcomer. William Lines had a brand-new ship, the Misamis Occidental in the same year she was fielded but she was clearly outmatched by the Sweet Faith because maybe when they finalized the design of the ship they did not see Sweet Faith coming to upset the chart. The biggest shipping company then, the Compania Maritima, which had the resources to compete did not react and continued their stress on the route passing through Cebu before sailing for Western and Southern Mindanao up to Davao. That was also the response (or lack of response) and strategy of the Philippine Steamship and Navigation Co. which would be later known as Aboitiz Shipping Corp. and besides their luxury trio were already 15 years and outmatched and so maybe they thought they really have no option at all except to not really compete. Meanwhile, Escano Line’s priority was not really Cebu at all, its ships cannot really compete as they did not stress speed when they ordered their brand-new ships. Go Thong & Co. might have been too busy in their European expansion through Universal Shipping and maybe they thought getting all the copra in all the ports possible made more sense (they had lots of small ships for that purpose). General Shipping Corp. and Southern Lines Inc. were also gone and Galaxy Lines, the successor to the Philippine Pioneer Lines was also near to floundering already. Negros Navigation Company, meanwhile, was not competing in the Cebu route and it is in the Manila-Iloilo route where they were flexing the muscles of their brand-new liners. For two years until 1972 Sweet Faith ruled the Manila-Cebu route. It will be up to a shipping company which long relied solely on ex-”FS” ships (until 1966) to challenge Sweet Faith with their upcoming newbuilding which will turn out to be the liner Cebu City. A sister ship of the liner Don Juan, the flagship of Negros Navigation Company, she was fitted with bigger engines. Since Don Juan can only do 19 knots maybe they decided on bigger engines to be able to compete with the 20 knots of Sweet Faith. Cebu City came in 1972 that began the battle royale of the two flagships whose intensity passed the two ships to shipping folklore long after both ships were gone (only the millennials would not have heard of their battles). In 1973, the liner Sweet Home of Sweet Lines arrived to form a “tag team” to battle Cebu City. She was not as fast as the two at 18 knots but she was bigger and as luxurious as the Sweet Faith because she was already a luxury ship in Europe when she was still the known as the Caralis. In 1975, Sulpicio Lines joined the Manila-Cebu “flagship wars” when they acquired the second Don Sulpicio from RKK in Japan. Unlike their previous ships this liner had no cargo ship origins. A fast cruiser at 18 knots and with accommodations much like the Cebu City she was also a legit contender. In this wars it is not only speed that was advertised but also punctuality of departures. That is aside from the food, the amenities and the passenger service. In 1976, the newly-arrived Dona Ana also joined this fray. She was a sister ship of Don Sulpicio but faster at 19 knots and newer. However, she was a Manila-Cebu-Davao ship and she only competed in the Manila-Cebu leg as a “tag team” too with the second Don Sulpicio. Dona Ana also started a new paradigm on her own, the fast cruiser to Davao which she can do in only three days compared to nearly a week of the others. The flagship of Compania Maritima, the liner Filipinas was forced to respond by cutting ports of call and announcing they will sail the Davao route in only 4 days. In a sense this was also a “flagship war”. 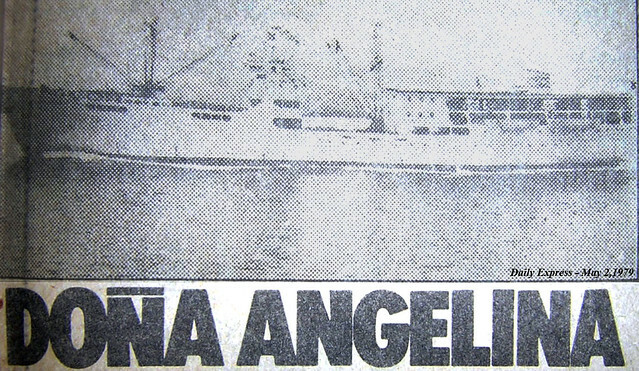 Later, the Dona Ana became a replacement flagship in the Manila-Cebu route when Don Sulpicio was hit by a bad fire in 1979 and her repairs took two years. By that time, it was another new fast cruiser of Sulpicio Lines, the Don Enrique (later the Davao Princess) that was battling the flagship Filipinas of Compania Maritima in the Davao route along with the liner Manila City of William Lines [there will be a future article on these Manila-Davao fast cruiser battles]. Sweet Faith and Sweet Home lasted just less than a decade in the Manila-Cebu “flagship wars” because they were already old ships when they first came here. Sweet Home quit earlier about 1978 and Sweet Faith quit in 1980. However, even before she quit, the new flagship of William Lines, the Dona Virginia has already arrived. She will be linked in an epic battle not with a flagship of Sweet Lines but with a flagship of Sulpicio Lines. This liner is the Philippine Princess which came in 1981. Dona Virginia had the upperhand as she was faster, bigger and more beautiful-looking and she ruled the Manila-Cebu route. Both were exclusively Manila-Cebu ferries and like those that came in the 1970s they had no cargo ship origins. In this decade Compania Maritima was no longer in the running as they no longer had new ship acquisitions and in fact they quit when the financial and political crises spawned by the Ninoy Aquino assassination broke out. After an interregnum of two years without a dedicated Manila-Cebu liner, Sweet Lines brought out their new challenger, the luxurious Sweet RORO but she was smaller and her speed was slightly inferior to the flagships of William Lines and Sulpicio Lines. However, she was as luxurious if not more so and she trumpeted an all-airconditioned accommodations and she was a true RORO which was the new type and paradigm that was gaining already. Meanwhile, Aboitiz Shipping Corp. gave up all semblance of a fight and just concentrated in container shipping. The Carlos A. Gothong Lines and Lorenzo Shipping Corp. also withdrew from the Cebu route for practical purposes. Escano Lines were also not buying ships like Aboitiz Shipping and also were not contenders. Negros Navigation Company, like before was not competing in the Manila-Cebu route. Suddenly, in 1988, Sulpicio Lines did what was equivalent to exploding a grenade in the competition. They were able to acquire the Filipina Princess which broke all local records in size and speed. It was far bigger and far faster than the Dona Virginia of William Lines and was a true RORO. Even though William Lines was able to acquire the RORO liner Sugbu in 1990, she was not a bigger or a faster ship than the Dona Virginia she was replacing as flagship. To rub salt on wound, in the same year Sulpicio Lines also acquired the Cotabato Princess and the Nasipit Princess which were also bigger than the Dona Virginia (and Sugbu) though not as fast. So for few years, in terms of size, Sulpicio Lines possessed the No. 1, 2 and 3 position in terms of ship size. As to the others, in 1987, Sweet Lines was able to acquire the Sweet Baby but she was not as big as the William Lines and Sulpicio flagships nor can she match them really in speed. Soon, Escano Lines would be quitting liner shipping. There was really a big “consolidation” in the liner shipping industry, a euphemism to cover the fact that a lot of liner shipping companies sank in that horrendous decade for shipping that was the 1980’s. Again, Negros Navigation Company was not competing in the Manila-Cebu route. With this “consolidation” it just became a mano-a-mano between Sulpicio Lines and William Lines in the Manila-Cebu route with the others reduced more or less to bystanders…. With the exception of De la Rama Steamship Company, the Philippine liner shipping companies that were born or resurrected after World War II were dependent on the former “FS” (for Freight and Supply) ships from the US Navy. That type of ship was the backbone of our postwar passenger fleet; it was also the most numerous. One reason for that was so many of that type was built during World War II and most were deployed in the Pacific Ocean campaign of the US. Having to pay for the Philippine prewar ships they requisitioned for the war effort that type became the most common replacement given by the US together with the former “F” ships. Aside from direct replacement, the US also had to dispose so many of them and instead of bringing them back to the US where they have no use of them, many were just given to the Philippine government as aid and reparations. The Philippine government then put them up for sale at near-bargain prices (about $60,000 only; where can you get a ship that cheap?). Of course, as always, political considerations mattered and so those who have political connections had the inside track in the purchase of these vessels. 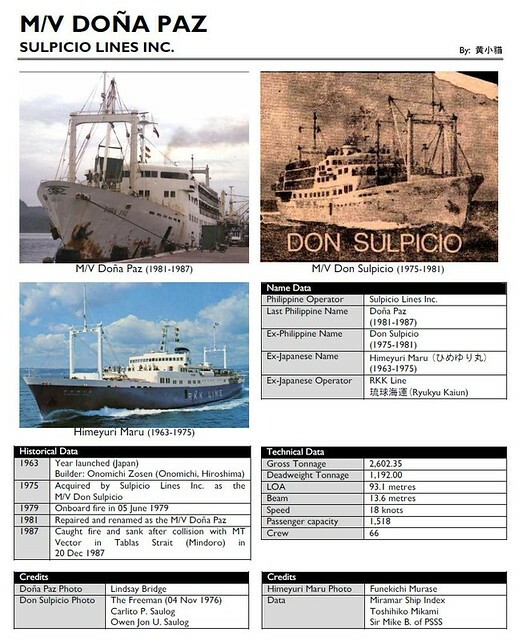 Many of the Philippine liner shipping companies were so enamored with these former “FS” ships that they practically purchased no other vessel type for the next twenty years after the war. Among those were William Lines Incorporated, Southern Lines Incorporated (they also had former “F” ships too) and General Shipping Corporation. In other liner shipping companies’ fleets like that of Philippine Steamship Navigation Company/Everett Steamship, Hijos de F. Escano Incorporated and Manila Steamship Company, the former “FS” ships were in clear majority. Even in the venerable Compania Maritima’s fleet half of those were former “FS” ships. Meanwhile, half of fleet of Madrigal Shipping Company was composed of former “Y” ships which were related to the former “FS” ships. These were former tankers converted into passenger-cargo ships. There was no Negros Navigation Company route then yet to Manila. What had a route then to Manila was the small Ledesma Shipping Lines. Negros Navigation Company became a liner company when they and Ledesma Shipping Lines merged. Being “enamored” with former “FS” ships also had a reason. They were cheap and while they may be basic sea transportation, the passengers were willing to put up with its deficiencies. And for whatever deficiency, sometimes good food is enough to make passengers overlook it. And so whenever a former “FS” ship becomes available in the market the liner shipping companies readily snapped it up. That goes true even for the fleet of the shipping companies that quit the shipping business like Manila Steamship in 1956 (along with some much smaller shipping companies). The future great Carlos A. Go Thong & Company was not among the recipients of ships from the US as reparation. Their first ships were salvaged “F” ships that they bought. They only had their first ex-”FS” ships when they bought out the Pan-Oriental Shipping Company of the Quisumbings of Mandaue which then went into motorcycle assembly (the Norkis-Yamaha concern). Like Go Thong, the style of the other smaller passenger liner shipping company was to lengthen the hull of the former “F” ships so these will be “FS” ships equivalent. That was the origin of the first flagship of Go Thong, the Dona Conchita. However, some other small liner shipping companies which did not have enough capital or were just sailing minor routes simply sailed straight their small ex-”F” ships. Some other were also using converted minesweepers and PT boats. Many of the shipping companies in regional routes were using converted “F” ships and converted minesweepers. These former “FS” ships like the other war surplus ships from the US like the “C1-M-AV1” ships were classified as “passenger-cargo” ships. Obviously, they carry passengers and cargo but it actually has a deeper meaning. In those days, passenger liner shipping companies don’t normally operate pure cargo ships like these recent decades. It is actually these passenger-cargo ships that carry the bulk of cargo in the inter-island route in liner operations (which means there is a fixed route and schedule). The passenger capacities of the ships then were small (there were no 1,000-passenger capacity liners then yet and tops then was just about 700 passenger capacity and normal was just about 300). What was more prized then sometimes were the cargo holds of the ships. Handled by booms (there were no container vans yet) the interport hours were long and departures especially in the interports were not prompt. As long as there is cargo to be loaded, the ships would not leave. Unloading of cargo then in the interport can already take several hours and with so many interport calls the longest-distance ports like Davao takes one week to be reached. In the mid-1960’s the workhorse fleet from former US Navy ships were already long in the tooth. There were no more of that type to replace the hull losses and our population and trade was growing. Mindanao too has already experienced great migration from the Visayas and so migrants had to travel and goods had to be exchanged. Obviously there was a need to refleet or add to the fleet. The only company that was still able to acquire former “FS” ships from the US in the 1960’s was the newly-established Philippine President Lines, a shipping company well-backed from the highest circles of government. Most of what they were able to acquire were former “AKL” ships of the US Navy. These were former “FS” ships retained by the US Navy after the war and refurbished for use in supplying the many scattered islands and bases of the US in the wide Pacific Ocean. These ships were among the last of its type released by the US. Some liner shipping companies which had easy starts because of political connections, specifically, Southern Lines Incorporated and General Shipping Corporation shirked from the challenge and quit shipping and simply sold their ships. Southern Lines’ ships went to various liner shipping companies while that of General Shipping Company was divided between Aboitiz Shipping Corporation and Sweet Lines Incorporated. Amazingly, this gave birth to two separate events and entities. Once again, Aboitiz Shipping Corporation had a fleet of its own (before they were just a partner in the Philippine Steamship and Navigation together with Everett Steamship of the US; before the war they were partners with Hijos de F. Escano in La Naviera Filipina). The second event and entity was the regional shipping company Sweet Lines Incorporated became a long-distance liner company. General Shipping Corporation, meanwhile, followed another bandwagon and moved into foreign routes using ships chartered from the National Development Corporation of the Philippine government. It was not difficult for them because they were well-connected politically. Since no surplus ships were still available from the US then a new source had to be found. Japan by this time was still building their merchant fleet because these were the years of Japan’s “economic miracle” of galloping growth and so no surplus ships were still available from them at that time. The only logical place to look at would then be Europe as the US as a nearly solid continental country has many locomotives and rail wagons but not passenger liner ships. Before this time Compania Maritima has already shown the way in sourcing surplus passenger-cargo ships from Europe. It was easy for them since they have Spanish origins and connections. I will start from the companies that made moves in acquiring passenger cargo-ships from Europe starting from the one which made a big move. It was the shipping company Carlos A. Go Thong & Co. that was not a recipient of US reparations which took a big gamble in acquiring passenger-cargo ships from Europe. I don’t know but maybe there should not be a great deal of surprise there as they did not get any favors from the US or the government before which means they will have to pull their own bootstraps up themselves if they want to move up. And over a period of six years until 1969 they acquired a total of 9 European passenger-cargo ships for local waters (the Gothong, Dona Pamela, the Dona Gloria, Tayabas Bay, the Dona Rita, the Dona Helene, the Don Lorenzo, the Don Camilo and the first Don Sulpicio. Aside from the nine, Go Thong was able to acquire the big ships Subic Bay, Manila Bay and Sarangani Bay. The first two were C1-A ships of US built but acquired from Europe while the last was a former ship of De la Rama Steamship. Also acquired in the same period was Dona Anita, the former Governor B. Lopez of Southern Lines which has airconditioning and the Dona Hortencia, a former Northern Lines ship of Japanese origins. Three of these ex-European ships were former refrigerated cargo ships and that means a lot because with refrigeration facilities then Go Thong can then build First Class sections, lounges and restaurants that have airconditioning. So cold drinks will be available anytime too (when the bulk of Filipino homes don’t have refrigerators yet) along with the capacity to carry loads that should remain frozen or chilled. These things were simply not possible with the ex-”FS” ships and besides these former ships from Europe were bigger, a little faster and they have big cargo holds which means more capacity for generating profitable runs. With 14 ship acquisitions Go Thong was already more than Compania Maritima in the inter-island routes before they broke up in 1972 even though they are using their big ships to Europe and the Far East. For a major, William Lines Inc. had a rather tepid response. They only acquired two surplus ships from Europe (the sister ships Virginia and Zamboanga City, the first) in the mid-1960’s but they bought two former “FS” ships (the Dona Maria and Don Jose) let go by the other liner shipping companies (yes, they have a definite liking for that). The new liner company Sweet Lines Inc. acquired only one surplus passenger-cargo ships from Europe in this period (the Sweet Bliss) and that is understandable as they were just a new liner company. However, they also bought two passenger-cargo ships discarded by the other liner companies (these were not former “FS” ships). Meanwhile, Aboitiz Shipping Corporation, at the same time did not purchase any passenger-cargo ship from Europe. But in Philippine Steamship Navigation Company (PSNC) they had three passenger-cargo ships which has airconditioning and refrigeration which only arrived in 1955 (The Legaspi, Elcano and Cagayan de Oro). In effect, for them this is their equivalent of the passenger-cargo ships from Europe. The Philippine President Lines and its successor company for local routes Philippine Pioneer Lines purchased only one passenger cargo ship from Europe (the Aguinaldo) as they were already concentrating on their international routes (and that ship was soon passed to their foreign operations). In fact, they soon transferred their local operations to their subsidiary Philippine Pioneer Lines. Special note should be given to two liner shipping companies that took a different tack and the higher road — those that purchased brand-new liners instead of surplus. One of them was Hijos de F. Escano (later known as Escano Lines). What they did was to take out loans and they ordered three brand-new passenger-cargo liners from West Germany which already had airconditioning. These are the Fatima, Agustina II and Fernando Escano II. Negros Navigation Company, meanwhile, which is establishing itself as a liner company outdid them and took a different supplier. They ordered brand-new liners with airconditioning starting in 1962 which was followed by one each in 1965 and 1967. Those ships were the second Princess of Negros, the Dona Florentina and the beautiful Don Julio, the second. The difference was they ordered their liners from Japan except for the first which was ordered from Hongkong. Compania Maritima also ordered one brand-new liner with airconditioning from West Germany, the Visayas. Compania Maritima also acquired two big cargo-passenger ships from De la Rama Steamship, the Lingayen Gulf and the Sarangani Bay. They also acquired a local-built liner from General Shipping Corporation that had already airconditioning which they renamed as the Mactan. As a footnote, Sweet Lines Inc. also ordered one brand-new liner from West Germany, the Sweet Grace which for me was rather surprising for a new liner company given that older but more “conservative” liner companies did not go into this direction. Among those that did not make moves were Madrigal Shipping Company and De la Rama Steamship, two formerly revered names in shipping. Madrigal Shipping Company were then already disposing ships either to the breakers or to other companies. Among the local liner shipping companies, they, together with the already-defunct-then Manila Steamship Company had the penchant for buying really old ships from Europe before and so its expected life is not long. Moreover, Madrigal Shipping Company was by this time already losing in their quixotic routes to Northern Luzon and Northern Bicol and it was just practically using the remaining life of the ferries they have not disposed off. They had only one ship acquired from Europe in this period that they did not immediately dispose of and this was the Viria. Like the rest of their acquisitions this was small because their routes were minor compared to the rest. Hence, this acquisition was not comparable to the European acquisition of the others. Meanwhile, De la Rama Steamship at the middle of the 1960’s was beginning to function just as international shipping agents. They have already disposed then of almost all their ships including those chartered from the National Development Corporation and they have long disposed of their former “FS” and “F” ships. Two of their big ships went to Compania Maritima in this period. The smaller passenger liner companies with lesser routes and revenues proved incapable of moving up to the European category of ships, brand-new or surplus. However, four upstart companies tried to join this trend. The new Dacema Lines Incorporated was able to purchase two old passenger-cargo liners from West Germany in 1967, the Athena and the Demeter. The new E. K. Litonjua Steamship Company Incorporated/Eddie Steamships (Philippines), Incorporated was able to do likewise with three old passenger-cargo ships from various countries, the Sultan KL, the Aurelio KL and the Eddie KL. Another upstart, the Northern Lines Incorporated was able to acquire two passenger-cargo ships in this period (along with cargo ships), the Don Salvador and the Don Rene and surprisingly the source of their ships was Japan. Another newcomer, the MD Shipping Corporation was also able to procure a surplus passenger-cargo ship from Norway, the Leon. Except for the Northern Lines ships the ship mentioned did not really last long because they were already old when they can here. These moves or non-moves determined the fate of the liner shipping companies for the next ten years. With the bold move of Carlos A. Gothong & Co. they moved up fast in the totem pole of the local liner shipping companies that by the start of the 1970’s they were not only barking at the heels of Compania Maritima but has already achieved parity or were even slightly ahead already in the inter-island routes. On the other end of the pole those that did not acquire any or practically had no acquisition were already gone from the inter-island routes in the next ten years and this included Philippine Pioneer Lines and the successor company Galaxy Lines. Madrigal Shipping Company by then had also disposed of almost of their ships and had almost no more ships sailing. The ships of the two companies many of which were ex-”FS” and ex-”Y” ships went to minor liner companies NCL/NORCAMCO Lines (the former North Camarines Lumber) and N&S Lines. All these moves or non-moves in the middle of the 1960’s determined the fate and the positions of the liner shipping companies from the late 1960’s to the early 1970’s. Go Thong, a relative newcomer in liner shipping moved up a lot in liner shipping tier with their big acquisition. The liner shipping companies that made enough acquisitions in the mid-1960’s chugged along and generally did not lose rank for the next decade, relatively. Among these were Compania Maritima, William Lines Inc., Sweet Lines and Escano Lines. Philippine Steamships and Navigation Co. declined. The ex-”FS” ships were no longer as competitive in the 1970’s and the “C1-M-AV1” ships did not prove resilient and the the Type N3 ships even less durable. Negros Navigation Company was on the way up as they have new ship. The smaller liner companies that were still dependent of ex-”FS” ships (and the related ex-”Y” ships) and the ex-”F” and former minesweepers and were not refleeting were already on the way down. That included Bisayan Land Transport, NORCAMCO, N&S Lines, Rodrigueza Lines and many other small operators. As recap, twenty years after our inter-island fleet basically relied on war-surplus ships from the US, the first augmentation we had were ferries sourced from Europe as ships from Japan were still rare in the mid-1960’s because they were in the midst of their own economic boom. Up to the end of the 1960’s and early 1970’s we will still source liners from Europe (like the legendary Sweet Faith). It will in the next decade when Japan will be our main supplier of surplus passenger ships. So from war-surplus ships from the US in the end of the war and up to early 1960’s to European surplus ships in the 1960’s to Japan surplus ships in the 1970’s – these were what marked the early periods of our postwar liner shipping, the period most people now are no longer aware of. This article seeks to fill that void.